"Tigh-Na-Mara" is Gaelic for "House near the Sea", which describes its location exactly. 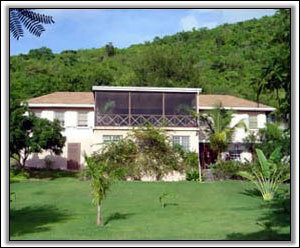 Offering spectacular views of St. Kitts and the Narrows channel, Tigh-Na-Mara is set in a beautiful tropical garden supporting wonderful plants & trees with an enviable elevated position overlooking Oualie Bay. 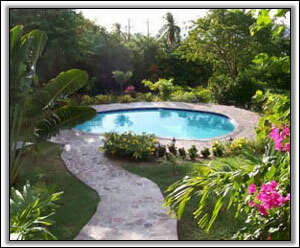 The owner has taken great care to give the villa the feel of "the old plantation style" with the combination of old and new mixed tastefully. 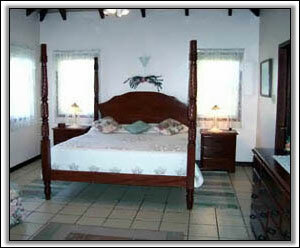 It has cathedral ceilings, is fully screened and living rooms and bedrooms are equipped with ceiling fans. 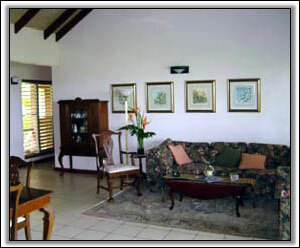 Each bedroom has its own cable TV while there is also cable TV, VCR, DVD & CD player in the living room which also offers a large book collection for those relaxing moments on the verandah. The villa comprises of a airy Master Bedroom with windows to 2 sides, King size bed, sitting area, ensuite bathroom and walk in closet. 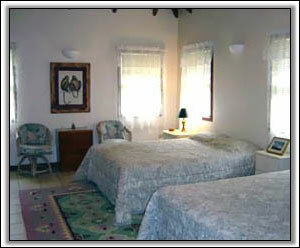 The second bedroom is bright, spacious and airy, having two queen size beds, large closet and separate bathroom. The open plan kitchen overlooks the dining room and also has views of the rockery gardens to the front which have an abundance of tropical plants. The fully equipped kitchen comes complete with fridge/freezer & automatic ice maker, microwave, dishwasher and four-burner gas stove. 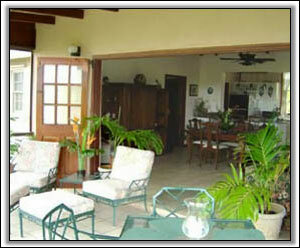 The living/dining room has an inviting, relaxing ambiance. 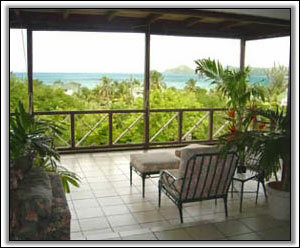 There is a dining table which seats six comfortably, and looks out onto the screened verandah with the delightful views of Oualie Bay & St. Kitts. The veranda also providing a second dining area with seating for four, a seating area and gas BBQ. The third bedroom, located on the lower level with separate entrance, has a King bed, table and 2 chairs, comfy wing chair, cable TV/VCR and CD/radio player and ensuite bathroom. From this beautiful room you walk out onto a grass patio with table, chairs and umbrella also 2 very comfortable sun loungers and pool. * The picture above is a bit old, the microwave, stove, and fridge have been moved to the utility room. 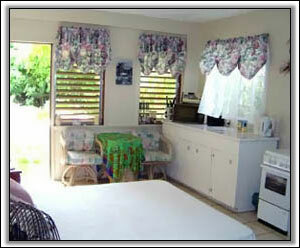 The utility room on the lower level has a washer and dryer, small gas stove, microwave and fridge. Housekeeping provided twice per week.